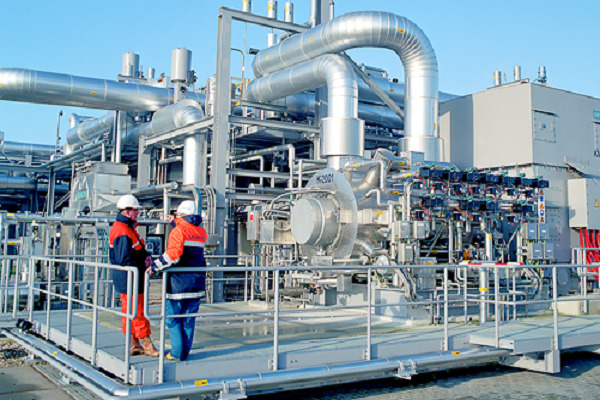 Global technology giant Siemens said it has been awarded a major contract by leading North American energy producer Encana to provide one feed and sales gas train and one refrigeration compression train for its pipestone processing facility in Grand Prairie, Alberta, Canada. Designed to accommodate future capacity expansion, the Pipestone Processing Facility will provide Encana with 19,000 barrels per day of net raw condensate processing capacity plus 170 million cubic feet per day of net inlet natural gas processing capacity. Keyera will own the Pipestone Processing Facility and provide processing services to Encana. The Facility will have total processing capacity of 200 million cu ft per day and is expected to start up in 2021. The first train will consist of a Siemens SGT-750 gas turbine driving two DresserRand Datum compressors for feed and sales gas compression, combined with a Siemens waste heat recovery unit for process heat. The second train will consist of a Siemens electric motor-driven Datum compressor for refrigeration compression with Siemens variable frequency drive. “Siemens state-of-the-art SGT-750 gas turbine is the only twin-shaft engine in its power class with industry-leading fuel efficiency and one of the lowest emission profiles,” said Patrice Laporte, VP, Oil & Gas for Siemens America. “The train configuration achieved by coupling the SGT-750 with the highly efficient Datum compressors provides an excellent solution for the Encana," stated Laporte. The SGT-750 turbine has a proven track record of satisfied customers in both power generation and mechanical drive applications and is becoming an increasingly popular choice among facility operators. In 2015, Siemens supplied three pipeline compressor trains driven by SGT-750 gas turbines to Central America-based Fermaca for its El Encino – La Laguna pipeline project. Phase II of its propylene dehydration plant. “We’re providing all of the equipment for these two compression trains from one source, which lends testament to Encana’s ongoing confidence in our equipment and Siemens’ capability to offer a one-stop solution to our customers,” said Matthew Chinn, the executive VP New Equipment Solutions for Siemens Oil and Gas. With maximized uptime and a low environmental emission footprint, the SGT-750 offers customers a lightweight industrial gas turbine designed and developed to incorporate the size and weight advantages of an aeroderivative gas turbine while maintaining the robustness, flexibility, and longevity of traditional heavy-duty industrial gas turbines. The Datum compressor line is known for its efficiency, reliability, and ease of maintenance which makes these compressors ideally suited for the un-spared feed/sales gas and refrigeration compression applications.